What’s involved with an installation? A personal visit to determine the water pressure, and volume, available: also measure the property so that we can design the system. We tie-in to the water source, run a main line, and divide the property into zones, or circuits, to make the best use of the water. Run wires from the valves that control these zones back to the timer, usually in the garage. Can I expect any damage? Damage will be minimal because of the equipment we use. The vibratory plow’s blase just cuts a small slid in the sod, pulling/laying the pipe or wire down as it goes. Do you do drip installations? Different areas require different treatments. Larger areas, lawns, would usually be watered with rotary heads because they throw farther and cover more area. There are also smaller mist heads, spray heads for smaller areas. But there are times when drip would be the best method of watering, Example- really small tight shrub beds, windy areas where they spray would be blown away from the plant, and especially vegetable gardens. We follow the manufacturer’s guidelines, and install it correctly. The newer controllers, timers, have special settings just for the drip, which will need to run for hours, not minutes, because it just drips. How much more will this cost to run? Probably less than if you were just dragging hoses around. You won’t have to worry about moving it, or leaving it on too long. Underground systems add value to your home both aesthetically and financially. Your garden will not be over/under or unevenly watered assuring your property will be more lush. 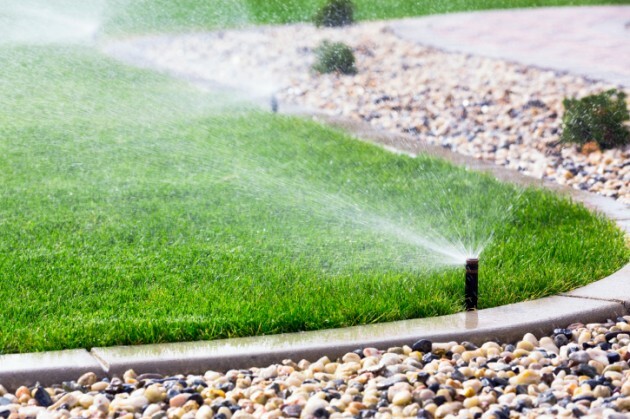 Many people use less water during the watering season because your systems are so much more efficient than conventional sprinklers. Each lawn is unique, the est watering times and length of watering depends on your grass and soil conditions. It is generally preferable to water infrequently for a longer. This will provide a deep water source that roots search for. Watering frequently for short times promote surface root growth. Our times have a shut off button for manual shut off. We also can connect the timer shutdown which is triggered by rainy weather. Does the systems need to be winterized? Systems should be winterized to prevent damage. We can winterize your system and in the spring. This will involve cleaning, flushing and adjusting the nozzles and heads reprogram the controller. We can tie the system into an underground water source. Because the water will tend to contain debris, sand, moss, and other contaminants we will install a “Sand Separator”. Filter cartridges are required.